Berman has redesigned a vaccine that he invented while at Genentech and led through clinical testing at VaxGen. This earlier vaccine, called AIDSVAX, was used in combination with another experimental vaccine in a large-scale clinical trial in Thailand involving 16,000 people. This trial (known as RV 144) showed that the combined vaccine was safe and 31 percent effective in preventing new HIV infections. After the results of the trial were released in 2009, Berman and other researchers pored over them to understand the nature of the protective effect. Although the effect was small, RV 144 is still the only clinical trial in which a vaccine has shown any protective effect at all against HIV infection. "By analyzing the results from RV 144, we started to understand the response to the vaccine, and I developed some new ideas for how to improve it," Berman said. "By building on an existing vaccine concept, rather than developing a new one from scratch, we can save millions of dollars and years of time getting the new vaccine into the clinic." Researchers believe that for an AIDS vaccine to be effective, it must stimulate the immune system to make "broadly neutralizing antibodies" that are effective against multiple strains of the virus. HIV is so highly mutable that replication of the virus in an infected person gives rise to a genetically diverse population of circulating virus, and this variability helps the virus evade detection and neutralization by the immune system. A neutralizing antibody recognizes a foreign protein (called an antigen), and by binding to it is able to block or neutralize the infectivity of the virus. For example, neutralizing antibodies that target an HIV envelope protein called gp120 can block a crucial part of the infection process in which gp120 binds to a receptor on the surface of T cells. The AIDSVAX vaccine was based on the gp120 envelope protein. One key to improving the vaccine, Berman said, came from independent lines of investigation pointing to the importance of antibodies that recognize a specific segment of gp120 known as the V1/V2 domain. The RV 144 trial results showed that protection was correlated with antibodies to this domain. Meanwhile, broadly neutralizing antibodies to this domain were isolated from a rare group of people known as "elite neutralizers," who produce antibodies that potently neutralize multiple strains of the virus. Studies of these broadly neutralizing antibodies yielded another crucial finding. The part of an antigen that is recognized by an antibody is called an epitope, and it is usually a specific sequence of amino acids in the antigen protein. Scientists studying antibodies from elite neutralizers, however, discovered that many of the most potent neutralizing antibodies actually recognize carbohydrate components called glycans that are attached to the gp120 envelope protein. "We knew that these broadly neutralizing antibodies existed for many years, but it came as a great surprise that they were directed to carbohydrate epitopes rather than the more common amino acid epitopes," Berman said. "We found that the vaccine that gave partial protection in the RV 144 trial had very little of the kind of carbohydrate required to bind these antibodies." So Berman's lab set out to produce antigens that would induce a strong antibody response to the glycan-dependent epitopes in the V1/V2 domain. Attaching the right kind of glycans to the protein was just one of the challenges. The envelope protein has dozens of epitopes, and most of the immune response is directed at ones that don't induce neutralizing antibodies. Compared to these so-called "decoy epitopes," the glycan-dependent epitopes are only weakly immunogenic. Berman decided to use fragments of gp120 to make protein scaffolds that would present to the immune system only the glycan-dependent epitopes recognized by broadly neutralizing antibodies, while eliminating the other gp120 epitopes. "The trick is to make the scaffolds fold up into the right three-dimensional shape, as well as incorporating the right glycans," he said. Berman's lab is now developing cell lines genetically engineered to produce viral proteins with the right structure and glycan epitopes to bind to broadly neutralizing antibodies with high affinity. This strong binding suggests that vaccination with these antigens could stimulate the immune system to produce the broadly neutralizing antibodies. In a paper published last year in the Journal of Biological Chemistry, Berman's team described the results of immunogenicity studies of these antigens. "I think we've got candidates that should be seriously considered for advancement to clinical testing," Berman said. "We started with a molecule that has already been tested in humans, and we've rebuilt it using envelope proteins and scaffolds with the right carbohydrates." Berman's lab is continuing to generate and screen new cell lines, looking for those that give the most consistent and reproducible production of antigens that perform well in immunogenicity studies. 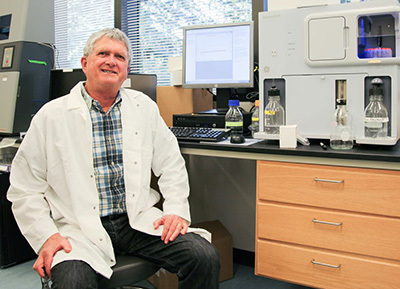 Thanks to NIH funding, he now has the facilities and specialized equipment to conduct rapid screening of cell lines and produce large quantities of proteins for vaccine research. Berman is also training the researchers and graduate and undergraduate students in his lab in the demanding techniques needed to develop this kind of recombinant vaccine. He noted that plans to repeat the RV 144 trial were stymied by the inability of other labs to reproduce the AIDSVAX vaccine, since VaxGen was no longer in operation. Similarly, he said, efforts to make Ebola antigens for a potential vaccine during the current outbreak in West Africa have been slowed by a shortage of researchers trained in these techniques. "We're training people with the skills needed to respond to emerging diseases like Ebola," Berman said. Berman's research is supported by grants from the National Institute of Allergy and Infectious Diseases (NIAID) and the National Institute on Drug Abuse (NIDA).